A dish that shows off 2 wonderful elements of a potato. The golden brown outside, and then the creamy smooth middle. Topped with a beautiful fresh salsa. The perfect potato dish that will fill you right up. I say this often but potatoes have got to be one of my favourite vegetables. And because of that, I get super excited whenever I get to experiment with them. And speaking of experimentation, you can make this recipe in whatever way you like. I always like to remind my viewers that while this recipe is great, it isn’t the be all and end all. You could add different herbs and spices to the potato filling, you could mix 1 or 2 egg yolks through the filling to help enrichen in, you could incorporate some parmesan into the filling to give it that extra kick. Something I want to try is to put some cheese on top of the potato, and then use a blowtorch to melt and gratinate that cheese. You can come up with so many different ideas so don’t limit yourself. So what do you mean by twice baked? So the process is simple. You bake the potatoes whole, cut them in half, scoop out some of the flesh to hollow them out a bit, put the flesh in a bowl and mash/mix it up with other ingredients, put that mixture back in the hollowed out potato and bake the potatoes again to finish them off. I love this method so much because you get two different types of potato in one. The mash potato filling, and the golden baked outside. Those 2 elements of a potato just work so nicely together. If you try to mash an undercooked potato, you will end up with mash and little hard chunks throughout it. And trust me, this can not go unnoticed, so make sure those potatoes are cooked all the way through. 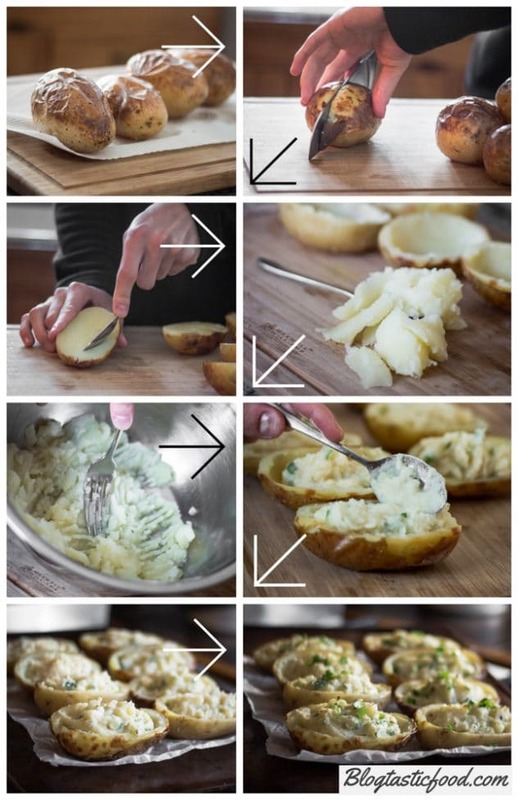 You can do this by sticking a small knife in the potato. If you feel resistance as the knife goes through, the potato isn’t cooked. It should go through the middle nice and smoothly. Also, make sure the filling isn’t too loose. I have made this mistake before by adding way too much milk, and then my potato filling was like slop! Definitely not appetising. Your filling should be solid enough to hold it’s shape. What should I serve with these potatoes? Remember, potatoes are quite a heavy, carb-filled vegetables. This is why I added the salsa because it doesn’t just work as a nice garnish, it also adds a freshness to the dish. So what should you serve with twice baked potatoes? Of course, this is just a recommendation because it’s all personal preference. However, I would avoid serving these potatoes with something like rice, pasta or bread. Otherwise, your plate of food will be carb central and you’ll be bloated by the end. I recommend a salad. A simple light, dressed salad that won’t fill you up too much and will still make the potatoes the star of the dish. So you can’t go wrong. Now, let’s move on to the recipe! If you decide to make these twice baked potatoes, I ask that you leave a rating in the recipe box down below. Also, if you are a potato fan, then you may also like this Easy Potato Curry recipe. Golden brown baked potatoes, and creamy smooth mashed potatoes. This recipe is about merging those 2 amazing elements of a potato together. Cook the potatoes in the oven for 50-60 minutes until cooked all the way through. Take the potatoes out but don't turn the oven off because you'll need it later on. Let the potatoes cool down for 5-10 minutes, then cut them in half lengthways. Scoop out most of the flesh in the potato, making sure that you don't scoop down to the skin of the potato. Leaving yourself with neatly hollowed out pieces of halved potatoes. Put the scooped out potato flesh in a bowl. Add your milk, your melted butter, a pinch of ground nutmeg, a pinch of ground coriander, 3 quarters of your chopped chives and a pinch of salt and pepper to the bowl with the potato flesh. Use a fork to mash the potato then mix everything together until well combined. Spoon that mixture back into the hollowed out potatoes, or you can pipe them in if you want to be extra fancy. Line the baking tray with a new sheet of baking paper, put the potatoes on the tray and bake in the oven for a further 15-20) minutes. Mix all of the ingredients together in a bowl until well combined and season with salt and pepper. Use this salsa to garnish the potatoes. Make sure the potatoes aren't undercooked. 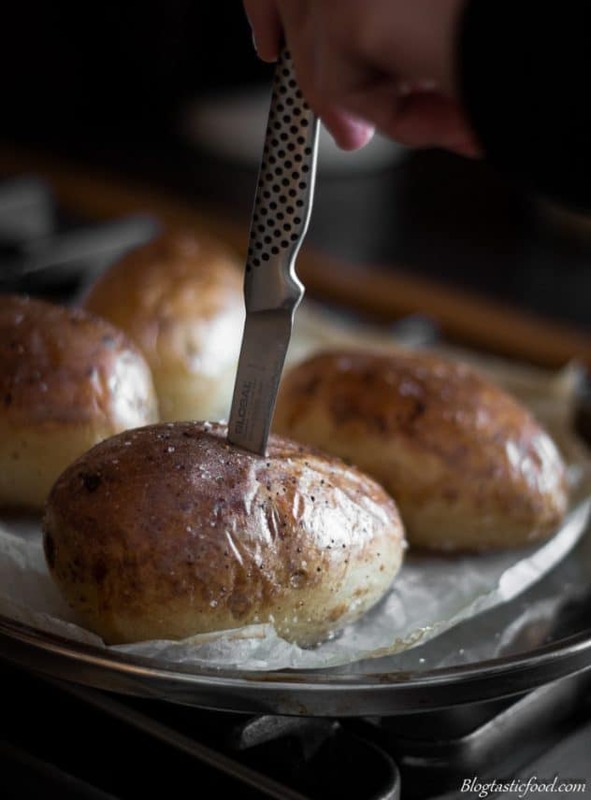 Stick a small knife in the potatoes, if you feel resistance, it means they need more cooking. If the knife goes through the middle of the potato smoothly, it means they are cooked all the way through. Don't add any more milk than what the recipe says otherwise you could end up with a loose sloppy filling. 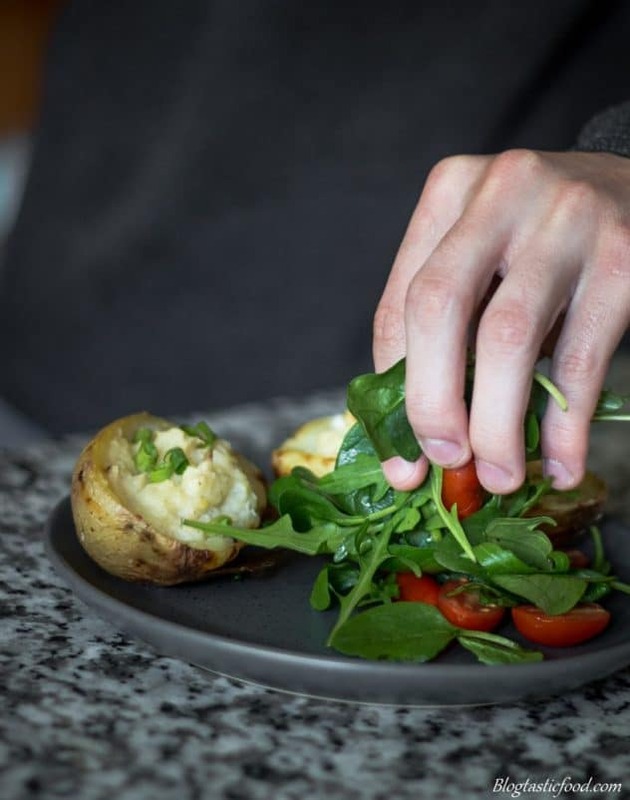 Serve the potatoes with something like a light salad. This dish doesn't need extra carbs. A simple and well executed recipe that is definitely tasty comfort food. Awesome!! let me know hat you think if you do (: Thanks for the comment. Although I usually limit my carb intake, this recipe seems worthy of skipping that philosophy for a special meal (especially since it will be eaten with a salad too)! Can hardly wait to try it. OMG, I’m so in the mood for this now. Yum! Delicious! 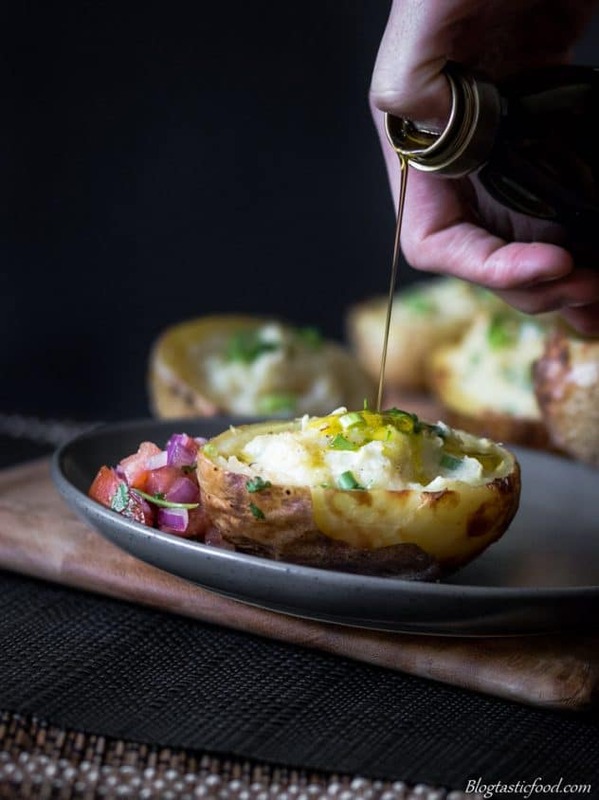 Love the twice-baked aspect of these potatoes Nicolas… I need to give this a try sometime soon. Twice baked potatoes are a delicious labor of love! These look so creamy on the inside and crisp on the outside with just the right amount of spice. The fresh salsa topping is such a nice, light idea! 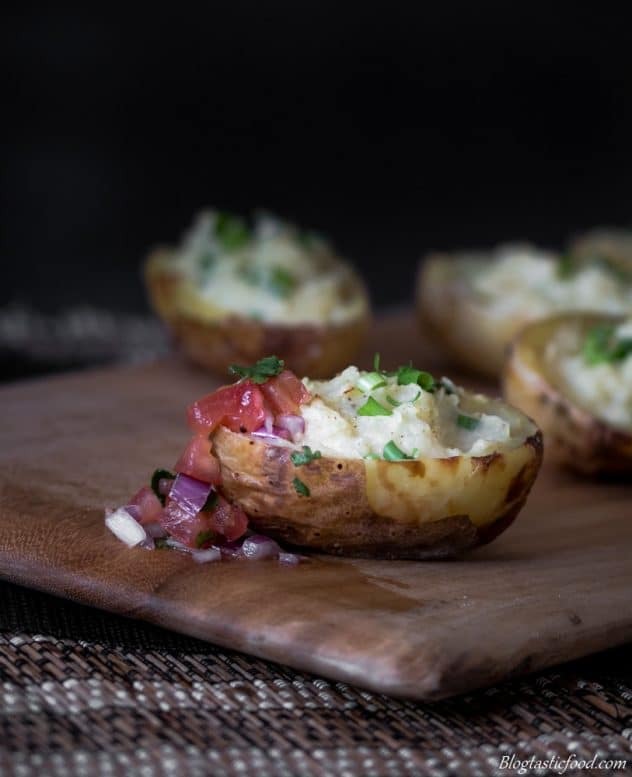 I love this spin on twice-baked potatoes! They’re one of my favorites 🙂 And those process shots are AMAZING!!! Potatoes are one of my favorite vegetables as well. Love this double bake so much! It was new to me, now I just can’t think of anything more satisfying 🙂 . Thanks so much!! They are definitely one of the best ways to serve potatoes. I love twice baked potatoes! Your recipe looks spectacular too. I love that you’ve topped it with such a scrumptious looking salsa! This is such a nice, healthy twist on a Steak House Classic! Love the sound of that topping! Yum! Absolutely love twice baked potatoes! They were really popular when I was a kid, but I didn’t appreciate all the different varieties until I was grown. Such a great meal. Gorgeous photos! Thanks Jenni!! I love them too. The Salsa definitely makes a difference. Twice baked potatoes are one of my faves. Reminds me of my grandma! 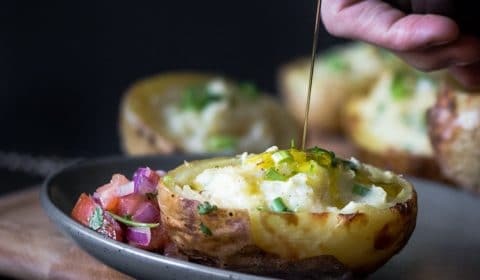 Oh my these twice baked potato sounds so delicious, bookmarking as it is so tempting. These look SO yummy! Love your photography and the step by step photos. 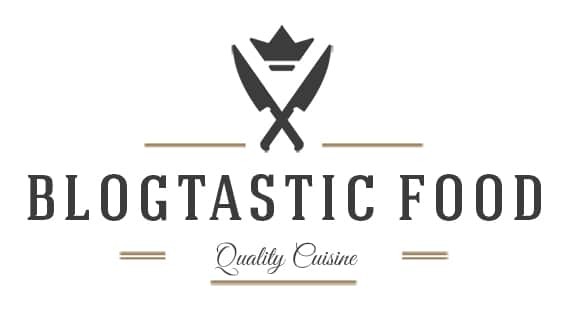 Just looking at your post is making me hungry! My 6-year-old is a total potato hater! He only likes ’em if they’re in French fry or hash brown form. But that means if I make these beauties, there will be more for me! Love the salsa topping and the tips for beautifully baked potatoes. Yum! I am making these this week!! So many amazing toppings that you could add them! Such a great idea to top with salsa. Definitely adds another layer of flavor and what a great contrast of flavor and texture. Very creative!